See more details under this awesome infographic we created. We love to share our food with or cats…or sometimes they just nab it off our plates when we’re not looking. However it works in your home, there are many people foods that are healthy for our feline friends and make a nice alternative to those prepackaged treats and dinners. But in the same line of thought, there are also toxic foods that can cause immediate or long term illnesses in our pets. Before you let your cat lick the licorice or gobble up the Sunday brunch, let’s discover what human foods cats can actually eat, which foods are fur-tastic, which are a no-go, which are not recommended and those that should only be used for special occasions. Can Cats Eat Chocolate? Never! Although, most cats don’t like the smell or taste of chocolate there may be some that surpass the “norm.” But letting your cat eat chocolate is putting its health at serious risk. The toxic ingredients found in this delicious treat are the large amounts of caffeine and theobromine. These can affect your pet with symptoms such as vomiting, diarrhea, irregularities in blood pressure and body temperature, along with weakness, seizures, cardiac arrest and even coma and death. Keep the chocolate desserts and confections away from those curious kitties. Can Cats Eat Dog Food? Not Recommended! The physiological makeup of a cat is vastly different from their canine counterparts, so for this reason it is not recommended to feed a cat dog kibble. According to Pet Education (Dr’s. Foster and Smith) cats are considered carnivores so they need a higher protein level in their food. Cats also cannot manufacture taurine, which is essential for their heart and eye health, or the fatty acid called arachidonic acid so these must be added into their daily diet. Good quality cat foods are nutritionally balanced with these necessary ingredients to promote good feline health. A cat that is allowed to eat a constant diet of dog kibble will eventually suffer from malnutrition. But don’t worry if your feline friend steals the occasional morsel from Fido’s bowl, the effects are cumulative over time. Most dogs go crazy over this sticky treat, but when it comes to cats…eeh...they can take it or leave it. This is probably a good thing as there is no nutritional value in peanut butter for our feline fur babies. Peanut butter tends to be high in fat, sugar and carbohydrates which can all lead to obesity and diabetes in cats. Too much ingestion of the PB can also lead to vomiting and/or diarrhea and can also pose a pasty choking hazard. Unless you are trying to sneak medication into your unsuspecting cat, leave the PB for the jelly and bread. Your human children may not want to eat their broccoli, but your cat can dine away on this green stuff with little worry. Although, if fed raw your feline may throw it back up, similar to eating grass outside, as they use it to purge hairballs. But if you give it a quick steam or boil, your cat may eagerly lick its dish clean. Keep in mind though that broccoli does contain a lot of fiber, so a little goes a long way in a cat’s digestive system. Because cheese is considered a dairy product many cats have a hard time digesting the lactose found in it. Too much lactose in cats can cause stomach upset, diarrhea and vomiting. However, if you have one of those felines that are able to eat bits of cheese without a problem, an occasional nugget is rich in calcium and high in protein and makes a good special treat. 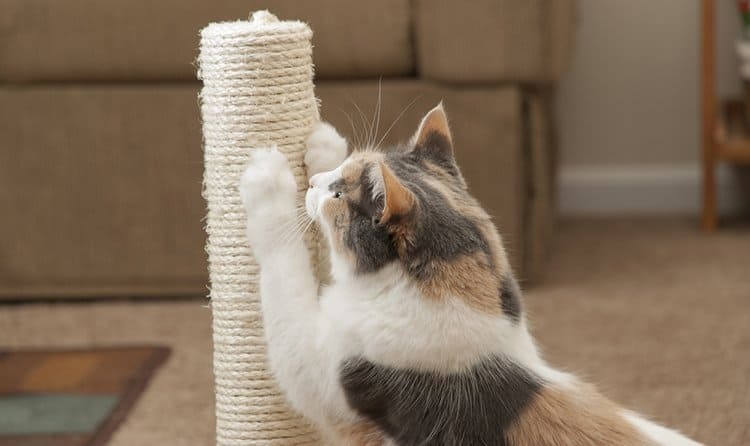 Cat pet parents may know the effects of catnip on their fur baby; rolling, licking, rubbing their faces into the catnip toy. But did you know the chemical in this mint-family plant is called nepetalactone? This chemical releases happy, feel-good pheremones in the cat’s brain. When it comes to eating the catnip over just smelling it, experts suggest providing your pet with a fresh plant rather than the dried stuff. And be prepared for a different result, as most cats get very mellow rather than acting erratic after they have nibbled on a leaf or two. Eggs are a good source of protein, but should only be fed to our cats cooked. Raw eggs can carry the Salmonella, Campylobacter and E. coli bacterias that can cause serious illness in our feline friends, which can then spread to humans. Also keep in mind that eggs, albeit a healthy protein, is not a balanced diet and should only be fed as a supplement. This functional fruit may not appeal to a carnivorous critter like the cat, but it is perfectly safe for your pet to nibble on a nugget of banana. This tasty treat is loaded with potassium, vitamins B6, C and manganese along with fiber. But be aware that too much of this fruit could cause diarrhea due to its fiber content. We as humans can utilize the many benefits bread has to offer our bodies; vitamins, minerals, proteins, carbs and fiber. However, since cats are carnivores they will gain no nutritional benefits from eating it, so stick to just the occasional morsel of this doughy snack. However, it is definitely worth mentioning that bread dough (raw) can be extremely toxic to cats. If swallowed, the warm nature of the cat’s intestinal tract will continue to allow the yeast to rise. This can cause bloating, pain and even blockages. For a more information see our detailed article can cats eat bread. Cats go wild over tuna fish, but according to WebMD, this protein packed for human consumption does not contain all the necessary ingredients our feline friends need for a balanced diet. The occasional piece is not a problem, but remember many canned fish contains mercury and can be toxic to cats in large doses. If you have obtained fresh tuna, then make sure it is thoroughly cooked and deboned before you allow kitty a taste; raw fish can carry many bacterias that can make your pet ill and bones pose a choking hazard. If you read the side of your cat food bag, you may see rice used as a filler. Rice is considered a carbohydrate and will provide your furry pal with some added energy. It is also good for cats that have an upset tummy as it is easy to digest. However, never give your pets uncooked rice as it has the opposite effect on the stomach (hard to digest) plus, rice is not a complete and balanced diet so use only as a treat or a supplement to its regular meal. Although, most cats will turn their noses up at the sweet stuff, yours may actually enjoy the occasional nibble of a strawberry. This alone is not a problem; however, too many strawberries can cause diarrhea and vomiting, so go easy on this particular treat. Popcorn is a food that has a double standard. On one side of the kernel cats can eat popcorn if it is all-natural without any added ingredients such as spices, butter or candy coating. Avoid prepackaged or even some microwave brands as they add in chemicals that can upset your cat’s stomach or lead to other problems. Experts also recommend not feeding popcorn to young kittens or senior cats as it could pose a choking hazard. For a more information see our detailed article can cats eat popcorn. Even though yogurt is considered a dairy product, it can actually be good for your cat in small servings. Yogurt contains live bacteria that is known for its intestinal health properties, so if you kitty has suffered from tummy trouble (as long as it’s not lactose-related) this may be a good way to help relieve its discomfort. But be aware that too much of a good thing can also cause diarrhea and vomiting, so use sparingly. This crunchy treat is loaded with vitamins and natural sugars, but your cat would have to eat a lot to get it’s full benefits. For this reason apple as a treat is fine, but overdoing it can lead to stomach upset as it is also high in fiber. If you decide to try apple bits with your cat, be sure to remove the seeds and stem as these components contain cyanide that can be toxic to your pets. We don’t really associate peanuts with cats, but unless your cat has a peanut allergy, this snack is okay for your furry pal in small quantities (one or two broken down). Avoid the shells of peanuts as these can pose a choking hazard and never allow your kitty to dine on spiced or candied peanuts as these can lead to serious health issues. For a more information see our detailed article can cats eat peanuts. A high quality cooked ham is a tasty, albeit non-nutritional treat for your cat. This meat tends to be high in sodium, so use in moderation when it comes to kitty’s portion. In addition, canned pork/ham foods are not recommended for your cat as these contain even higher levels of salt, preservatives and chemicals that can cause upset in your cat’s system. Carrots aren’t just for bunnies our furry felines can enjoy them too. This crunchy veggie is packed full of beta carotene and other vitamins and makes a healthy treat alternative. Experts recommend cooking the carrots first, as it could pose a choking hazard in its raw state. Cooked turkey is an excellent source of protein, so slipping her a few tidbits from your plate is a-okay, but do so in moderation. Although, this meat is considered a protein, it still does not contain all the necessary components cats need in a daily diet to stay healthy and active. This summertime favorite is delicious on a hot day and is perfect for quenching your thirst and for giving your cat a sweet treat. But do so with the following precautions in mind. Just like apples, the seeds of the watermelon do contain cyanide. These should be removed before allowing your pet to indulge in this fruity sensation. In addition to the seeds, the rind must be discarded as it does pose a choking hazard for cats. This fruit is considered a super-food because it is loaded in antioxidants which helps us and our pets build up a healthy immune system. Because of the many benefits of blueberries, some food manufacturers are now adding them into their formulas. Are they okay to feed raw? Yes, but do so in moderation as this tiny berry is also loaded with fiber that can cause tummy troubles. Can Cats Eat Raw Chicken? Never! Raw chicken (or any other raw protein) should never be fed to your cat. Raw chicken can carry the E. coli and Salmonella bacterias which can be harmful and even fatal to felines. Only offer your pet small portions of chicken (not the skin as it is high in fat) after it has been fully cooked and there has been no spices or sauces added to it. Corn is used in many commercial brand cat foods, so it is obviously not “bad” per say for your cat. However, corn is also a grain which does contain gluten. For those pets that have a sensitivity to this ingredient, it can cause itchiness, red and flaky skin and stomach upset. If your cat is not allergic to gluten, then the odd kernel here and there will not be a problem. Not only do cats go crazy over this seafood, it packs a wallop when it comes to having antioxidants and anti inflammatory properties. In addition, it also contains B vitamin complexes,vitamin E, selenium, phosphorous, zinc, copper and Omega-3 fats. And unlike other proteins, shrimp can be served raw, just be sure to have it cleaned properly. Although small bits of cooked and unseasoned potatoes are fine for cats once-in-awhile, green and raw potatoes, along with the plant and leaves contain a chemical called solanine. Eaten in large quantities this can lead to toxicity and even death if left untreated. There is a lot of hearsay and rumors floating around about our friend the avocado. Although it makes tasty guacamole for us, some species of this plant can cause toxicity in cats. This is because in all avocadoes (and the trees) there are different levels of a chemical called persin. Consumed in moderate amounts, this could lead to toxicity in your cat. Although, a tiny morsel may not affect your feline, don’t take the chance by purposely feeding it this food. The tomato itself is still under debate as to it being okay or not for cats. Many experts agree that the plant itself should not be nibbled on as it also contains the chemical persin. However, some people’s cats seem to be able to enjoy a piece of the fruit itself, while other cats have become extremely ill. For these reasons, it’s not recommended…why take the chance? Like many cured meats, bacon is high in sodium, nitrates and fat, all which are bad for animals and people. However, a small bit of bacon now-and-then most likely will not hurt your cat…just be sure it is thoroughly cooked. But be aware that too much can cause stomach upset and even obesity if fed in large portions or too often. Not all honey is created equally, so for this reason your cat should only be allowed to try small amounts of unprocessed, raw honey. Too much of this sweet stuff can lead to stomach upset, plus, it doesn’t really add any nutritional value to your cat’s daily diet. Once again we have a dairy product that makes the list of not recommended for cats. Once a feline reaches adulthood, it becomes lactose intolerant. Lactose is found in most ice creams and can cause diarrhea and vomiting in your pet. In addition, many ice creams are flavored with other products such as chocolate that should never be fed to our pets. But don’t worry, if Fluffy sneaks a lick off your ice cream bowl, she will most likely be fine as it’s not toxic. Can Cats Eat Chicken Bones? Never! We may think because chicken is fine for cats, so are the bones. This is simply not true. In fact, bones can splinter both in your cat’s mouth causing tongue and gum damage, a well as in the intestinal tract where they can cause tremendous pain and damage as it is trying to be digested. Discard all bones where your cat cannot have access to them to keep her safe. This super-food is also great for cats. It is high in fiber, antioxidants and almost every vitamin and mineral known to man. It also has glycoclycerolipids,which research has shown helps protect the lining of the digestive tract from damage due to inflammation. This leafy treat is a great low-calorie way to introduce greens into your cat’s diet. However, if your cat suffers from kidney or urinary problems, the calcium oxalates it also contains can make the conditions worse. Cats do need a certain amount of greens in their diet for optimal health. By providing him with the option of munching on some dark leaf lettuce, you will be providing your cat with some nutrients, fiber and moisture. Just be aware that some cats eat lettuce in order to vomit, so be prepared if you try this veggie. Can Cats Eat Garlic? Never! Although garlic is known to have a number of benefits to the human body, it can be extremely toxic to cats (and dogs) even in small quantities. Garlic in all forms (powdered, raw, cooked etc) is classified in the Allium family and can cause a condition called hemolytic anemia. This is characterized by the bursting of red blood cells circulating through your pet’s body. Toxicity in pets can also lead to gastroenteritis, also known as an inflammation of the stomach and intestines, which will cause stomach pain. Avoid all forms of garlic when it comes to your pets, including sauces, spices and baby foods. Can Cats Eat Onions? Never! Onions, shallots, leeks, chives and rakkyo (otherwise known as the Chinese onion) are also of the Allium family and can cause the same toxicity in our pets, just like garlic. For this reason they should never be given to our cats, even in small quantities or in any form. Although, there have been no reported cases of grapes being toxic to cats, they are extremely dangerous to dogs. Most cats will not indulge in this plump, juicy fruit, but why take the chance? Cooked or canned salmon can be a tasty treat for your feline friend…who’s cat hasn’t come running when they hear the salmon can being opened? It is high in those good fats and protein, but this meat should not be used as a replacement for a balanced diet as it lacks most everything your cat requires to stay healthy. What about the odd morsel slid into his dish? Not a problem. Another fruit to make the list is the kiwi. Although, most cats will show no interest in even approaching this fuzzy-peeled wonder, in small portions (and only once-in-awhile) a bit of the green “meat” of the kiwi does not seem to pose a threat to most cats. However, it does contain an enzyme known as actinidainwhich can cause allergic reactions in both people and pets. This berry is being called the weight loss miracle fruit, as it is supposed to help folks with losing those unwanted pounds. But when it comes to our cats, stick to the diet food. Although, experts aren’t saying a tidbit of acai berry will kill our pets, it does contain theobromine (like chocolate) so it’s best to stay away from this food when it comes to our furry friends. The “meat” of the fig itself is not known to be toxic to cats. However, freshly picked figs will ooze a white sap that can cause allergic reactions in both cats and people. The leaves of the tree and the rind of this fruit both contain a toxic enzyme called, ficin, which can cause skin irritation. If you want to try a fig with your cat, scoop out a nibble from the middle. With all the exotic fruits becoming more readily available, pet parents are starting to question the effects of this delectable treat; dragon fruit. The sweet and fleshy pulp of this fruit, according to the ASPCA, does not pose a problem for cats. However, use only in small amounts as too much may cause diarrhea and vomiting. This delightfully sweet treat is great for us, but when it comes to our cats, there are two sides to the answer. Pineapple (like the Kiwi) contains an enzyme called actinidain, which can cause allergic reactions in both humans and cats. Also canned pineapple should also be avoided as it is soaked in sweet sugars that cats do not need. If you want to give your cat pineapple, make sure it is fresh and then in only tiny tidbits. Black or red licorice both contain sugar which is not recommended for cats. Black licorice is derived from the licorice plant that contains a very distinctive flavor that most cats are not attracted to. However, if Fluffy were to nap a tidbit, it will most likely not be a cause for alarm. For the most part felines are finicky and are very choosey as to what they indulge in. However, if you are not sure how your cat may react to certain foods, then avoid them all together. Good quality cat kibble should be your cat’s main dietary source and is manufactured to be a balanced and nutritional food for your furry friend. If/when you do try to give your cat an occasional people food treat, do so sparingly until you know how it will affect him or her. And if your cat does eat something that is upsetting its system or it begins to show signs of an allergic reaction (swelling, trouble breathing, itchy red skin, hives) be sure to seek veterinary assistance immediately.